Most likely if you go to Guatemala, you’re going to go to Antigua. Love it or hate it, this is the home-base for most travelers when they’re here. 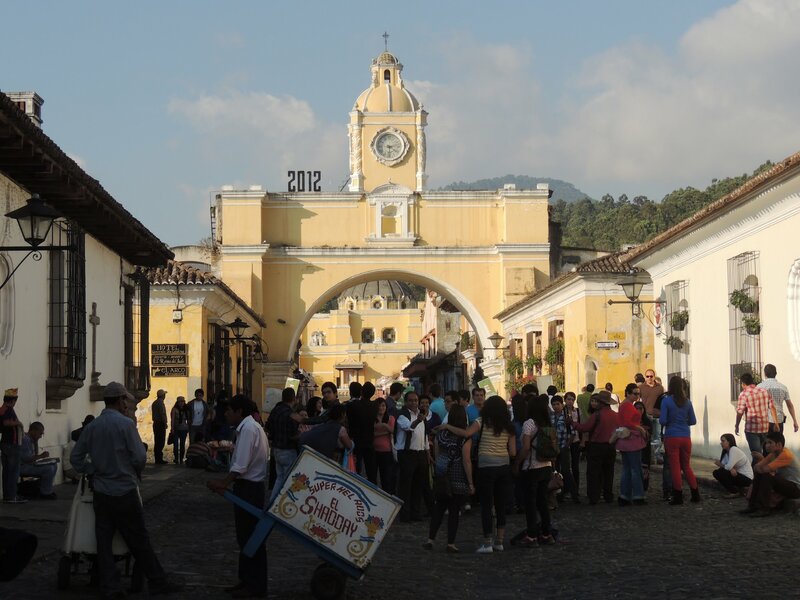 It may be pricier than Lago de Atitlán, and it’s definitely full of many more tourists than Guatemala City or Xela, but that’s Antigua. The city is small enough that you don’t need tuk-tuks or taxis to get around, and if you don’t know Spanish, that’s not a problem. Most people in the city speak English well enough that you can get by. So, have some fun and stay a while. There are a plethora of restaurants in the city. Typical meals cost anywhere between Q25 ($3.13) to Q45 ($5.63). With that said, here are four cheap spots where you can easily fill up for the best value. Disclaimer: I apologize that I don’t remember the names of the last two restaurants. They do exist. I promise. Tienda LaCanche– Q20 ($2.50) – You get: A big piece of chicken inside a soup served with a whole avocado and tortillas – Where is it: 6a Avenida Norte near 1a Calle, across the street from La Merced Church. It’s hard to find. You actually walk into a small store then walk behind the counter to sit down at one table. Don’t be shy. Most likely, you’ll have a conversation with someone here. 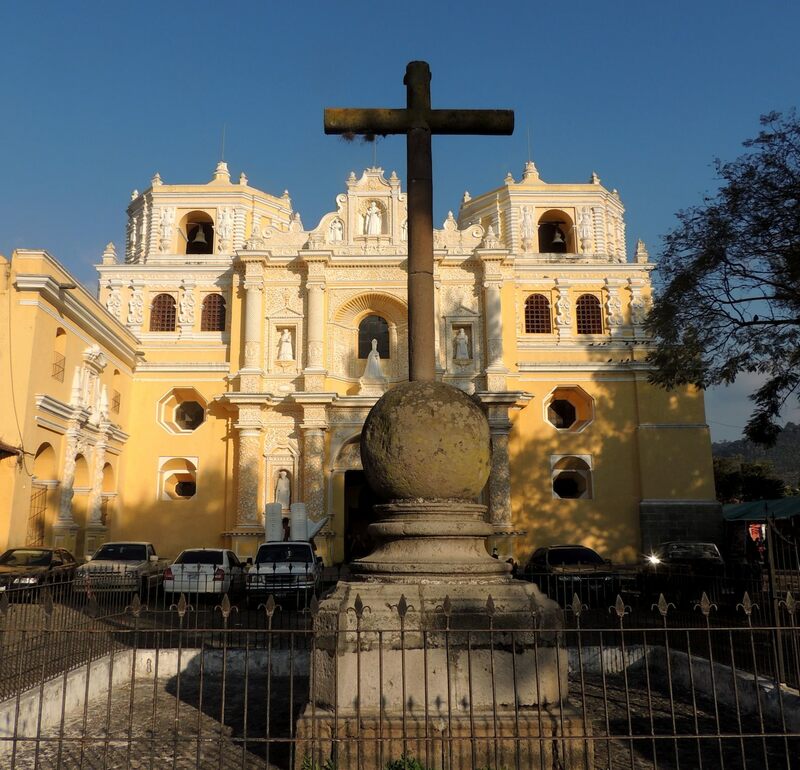 La Merced, cited as Antigua’s most famous church. Across the street is Tienda LaCanche. El Farol – Starting at Q15 ($1.88) – You get: Typical fast-food like Mexican fare, but the gringa quesadilla is a steal for Q15. It comes with a generous helping of steak, chicken or beef, sour cream, lettuce and tomatoes. – Where is it: 2a Avienda Sur between 7a Calle and 8a Calle. This place can be difficult to find, but you should be able to tell you’re in the right spot from a fairly commercialized looking sandwich board out front. Comedor on 3a Avienda Sur between 5a Calle and 6a Calle – Q20 ($2.50) -You get: A choice between chicken and pork (usually) and a decent sized piece. The meal also comes with salad, tortillas, rice and fresh juice. This is a great place where you’ll find lots of locals and a few tourists who have been able to scout it. Look for the people cooking in large grills just inside a building. Walk past them and seat yourself. Panadería on 2a Avienda Sur between 8a Calle and 9a Calle – Q10 ($1.25) – You get: A ham and cheese bagel. Coffee is another Q8 ($1). This should be pretty easy to spot. It’s packed with locals in the morning, but you don’t have anywhere to sit down. You could do what I did and sit on the curb. Y Tu Piña Tambien – Breakfast starts at Q15. Sandwiches start at Q20. – Where is it: Next to El Hostal and Cafe No Sé on the corner of 1a Avienda and 6a Calle – This place has cheap breakfast, fairly decent priced sandwiches and wi-fi. Locals do come here, but it’s more of a tourist hang-out. Order some coffee for Q10, and you can sit back and work or chat with the staff or the people who pass through. Rainbow Cafe – Lunches start at Q22 ($2.75) – Where is it: 7a Avienda Sur near 6a Calle – This place also has wi-fi, but it has only one electrical outlet. This is mainly more of a reading place, signified by the book shop in front of the restaurant. There’s always a group of people here lounging. At night, the restaurant has live music or speakers trying to promote a cause. To get a quick run through of the bars in Antigua, you can go on a pub crawl every Monday. It starts at 3 p.m. at The Terrace. A few bars will give you free drinks. Cafe No Sé – Where is it: 1a Avenida close to 6a Calle, across the street from El Hostal – This is one of the most awesome bars that I have ever experienced, and it’s always packed. Up front is where you’ll find the live music. Walk into the back, and you’ll find more seating and a second bar. But duck under a tiny door that feels like it’s set in Alice and Wonderland, and you’ll find the “illegal” mezcal bar. Shots range from Q20 – Q40 ($2.50 – $5.00). My advice: Try it. Cuba libres (rum and Cokes) are Q15 here. 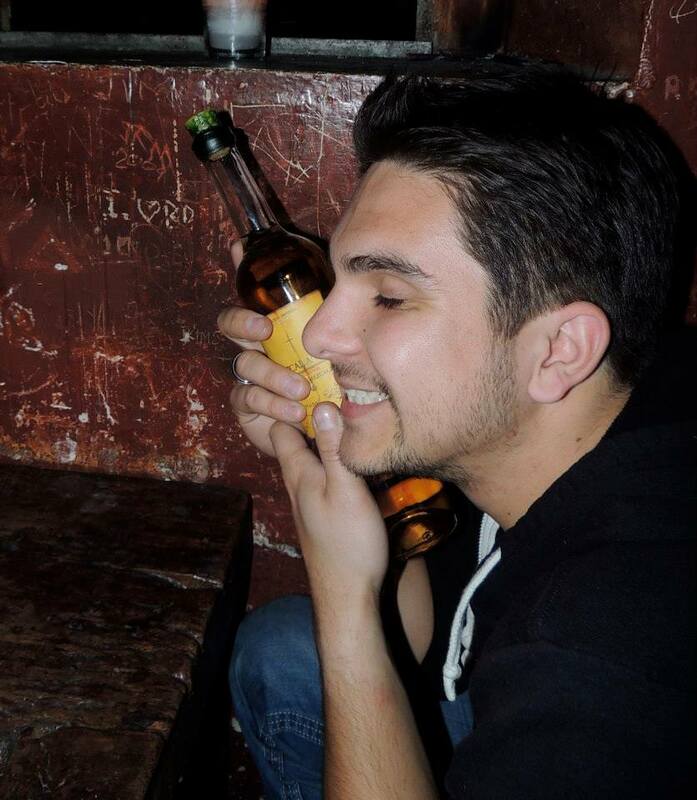 My friend was very happy after his mezcal purchase. Bottles cost Q200 ($25). Reiley’s Irish Tavern – Where is it: 6a Avenida close to 5a Calle – Maybe you want to feel like you’re back home. You can do that here, but be prepared to pay up. American beers like Blue Moon are served here for Q80 ($10). Gallo (Guatemala’s version of Budweiser) is Q25 ($3.13). This caters to a mainly tourist crowd, but a few locals pepper the mix. Monday is pub quiz night. It costs Q20, but you can win cash or a bar tab. Your choice. Por Que No? Café – Where is it: 2a Avenida and 9a Calle – This is a nice bar/restaurant in the south of the city. It can get packed because it’s so small. If there’s space, you can climb up to the second floor where there’s a little more leg room. The Terrace – Where is it: 3a Calle between Alameda de Santa Lucia and 7a Avenida – On the third floor of this hostel is a rooftop bar that gets wild at night, especially on Monday. Expect to see some bonfires. I suggest bringing marshmallows, graham crackers and chocolate to make smores. Fridas – Where is it: 5a Avenida north of 2a Calle – Mexican restaurant with a bar on the second floor. There’s live music a few nights a week. 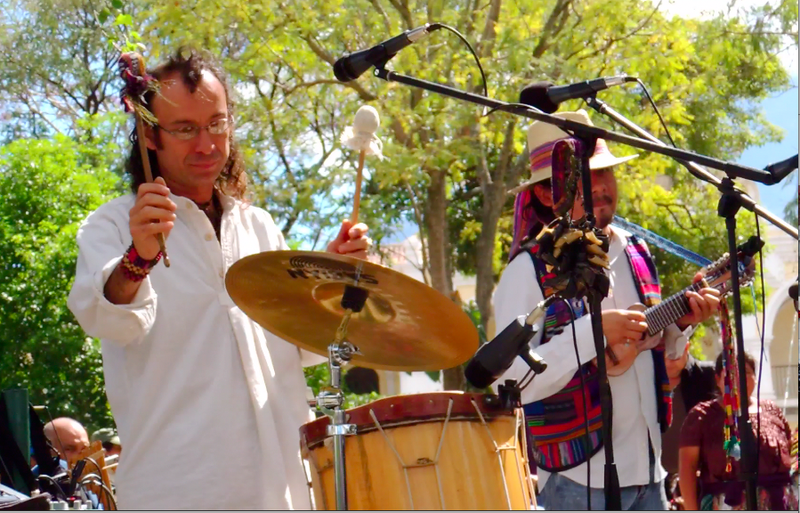 There’s always something going on in Parque Central. Parque Central – Where is it: Between 4ta Calle and 5a Calle, 5a Avenida and 4a Avenida – In the center of Antigua is Parque Central. It’s filled with trees and water fountains, along with families and teenage couples. You’ll get to know this because it’s your main source of orientation in Antigua, but it’s fun to watch the occasional band play here. 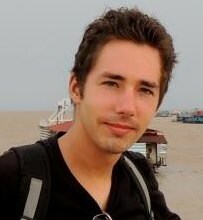 I recorded one of my Spanish language hacking videos here. 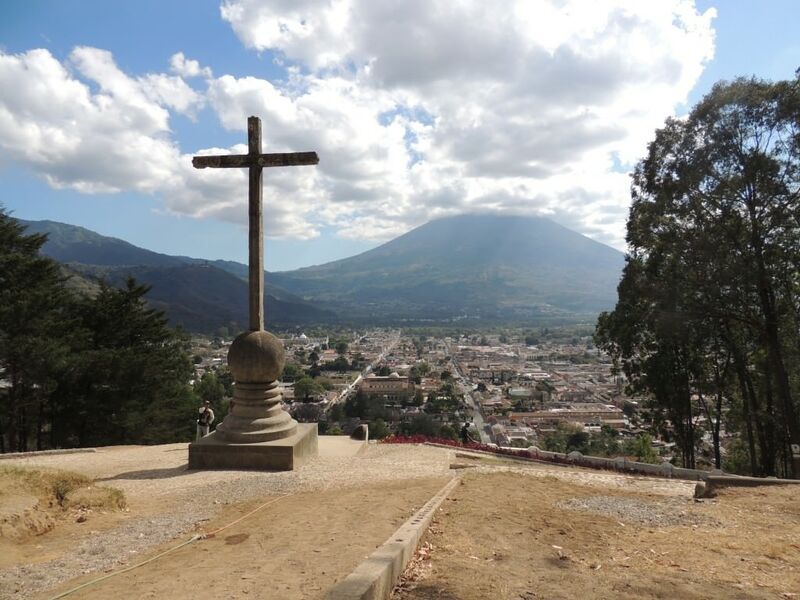 The Hill of the Cross offers some great views of Pacaya and Antigua. Hill of the Cross (Cerro de la Cruz) – Where is it: The path starts on 1a Avenida north of Calle Ancha de los Herreros – This is a five-minute hike that takes you to the top of a hill with a cross (hence, the name). You’ll get a decent view of Antigua from here. La Merced – Where is it: 1a Calle near 6a Avenida – Cost: Q5 ($.63) – You’ll see this bright, yellow church clearly when you’re in this part of the city. Going inside the church is free, but the ruins are what cost money. 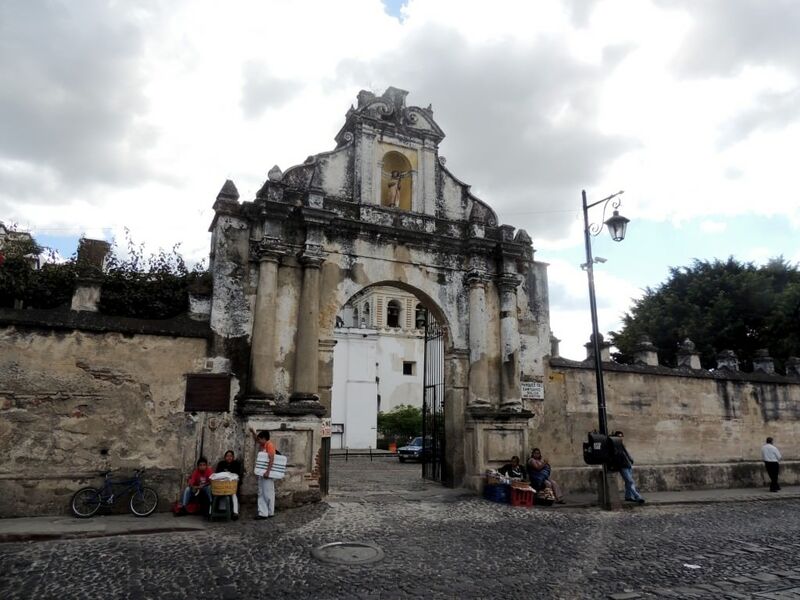 San Francisco – Where is it: 7a Calle and 1a Avenida – This is Antigua’s second most notable church. Again, you can go inside the building for free. 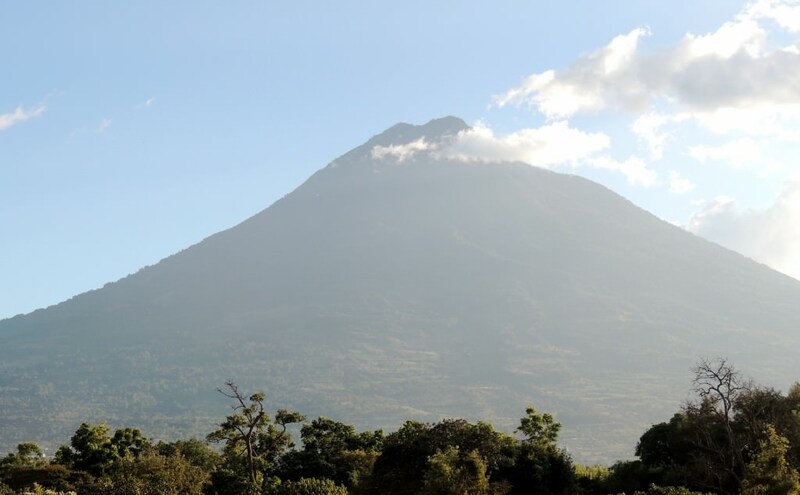 Hiking Volcán Pacaya – Cost: $15 – $75 per person (Depends on tour guide) – This is a common activity for travelers in Antigua; however, I did not take part because of the mixed reviews I heard from my friends. If you do go, hope that you’ll see some lava or that it’s a clear day. Use a reputable tour agency and make sure to bring flashlights, warm clothing and good shoes. And it’s a good idea to bring marshmallows for roasting. El Hostal – Q80 dorms – Where is it: 1a Avenida north of 6a Calle, across the street from Cafe No Sé – This is the perfect combination of a relaxed and socializing atmosphere. I wouldn’t classify El Hostal as a party hostel, but you can buy two Victorias for Q15 during happy hour. The courtyard is a great place to lounge in a hammock and talk with the other guests. You do get free breakfast and can use the kitchen in the afternoon. Water costs Q1 ($.13) to refill. Wi-fi is fast, but spotty. Villa Esthela– Q45 dorms, Q75 private – Where is it: 2a Avendia south of 9a Calle. It’s difficult to find, but walk down a courtyard across the street from a pharmacy. – If you’re on a budget, this can work more in your favor. There are plenty of areas to lounge, and the rooftop does offer some stunning views of the city. It also has a bar that’s open on some nights. The hostel has a kitchen and wi-fi. View of Volcán Pacaya from the rooftop of Villa Esthela. Pick somewhere else to do Spanish school – You want to learn Spanish, right? Why are you in the city with all the tourists? It’s very tough to speak only in Spanish here. In addition, the prices are outrageous compared to the rest of the country. 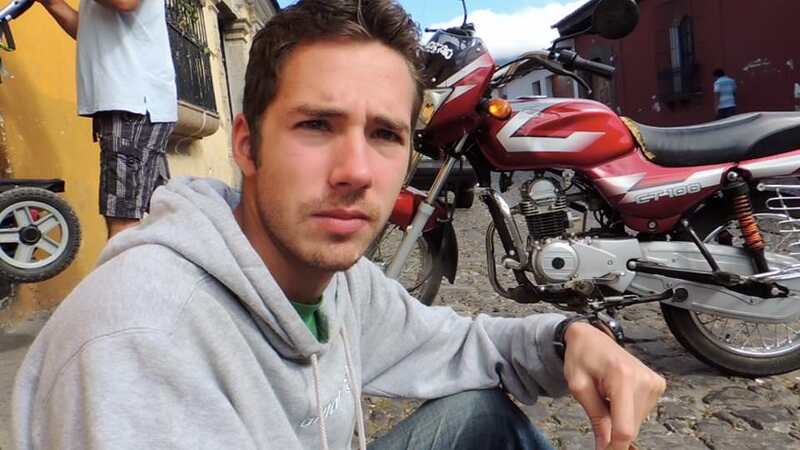 I did my Spanish school in Xela, but I also had friends take courses in San Pedro la Laguna. If you decide to do courses in Antigua, shop around and ask for discounts. Bring a sweatshirt – It gets cold at night. You’re in the highlands. Be prepared to haggle – If you’re in the market, make sure you’re not paying gringo prices. Be firm about the price that you’re willing to pay. If someone doesn’t want to play ball after a few counters, just walk away. Usually, the shopkeeper will come running after you with a more fair price.